Paramedical exams and related laboratory testing are vital pieces of the underwriting process when issuing policies to life insurance applicants. Inaccurate or incomplete data about an applicant could place him or her in the wrong risk pool, skewing their rating. Alternatively, the mistake can be an overlooked medical condition, leaving an insurance company exposed to claims that can cost thousands or hundreds of thousands of dollars. Insurers will always deal with accidents and other anomalies that actuaries can figure in their results, but they need accuracy in the basic information they gather about their applicants. 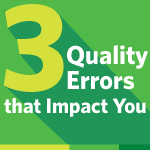 These three common quality errors can have a significant impact on underwriting decisions. Specimen quality – Delayed centrifugation can cause low glucose values and mildly elevated creatinines. Exposure to heat prior to specimen centrifugation has the greatest effect on specimen quality. We recommend that centrifugation occur within a few hours for optimum serum quality and that specimens are kept cool during transportation. Note: in-center exams eliminate this error completely since specimens are centrifuged immediately. Incorrect physical measurements – When an applicant’s blood pressure reading is taken incorrectly, or height and weight are not collected properly, underwriters are unable to make precise decisions. This can cause problems for both the insurer and the applicant by delaying policy issue or influencing an incorrect risk rating. Our Examiner App on the iPad has significantly decreased interpretation errors of measurements collected during the paramedical exam. Incomplete medical history – The medical interview is an extremely important part of the paramedical exam process, giving the carrier an opportunity to assess the level of health of each applicant. Missing information often requires a followup call or appointment with an applicant, which can negatively impact his or her overall experience of the life insurance process. Our health history collection method on the iPad and through our call center helps our examiners provide a thorough paramedical exam. As a service provider to insurance companies, we want our clients to be confident with the results they receive so they can be confident in their underwriting decisions. Errors cause serious implications for insurers, producers (agents and brokers), and their clients. An inaccurate result can jeopardize the relationship between a producer and a client. A broker, who has a choice of insurers to work with, may opt not to use insurers that have unreliable underwriting. Choosing ExamOne for exams and laboratory testing means choosing quality. We’re committed to our clients and your applicants, and implement a number of practices and programs to ensure we operate with consistent accuracy. To learn more about ExamOne’s quality monitoring programs, contact our Quality Department. Next post: Is “quick and easy” the right message for life insurance?